We did a lot of research on what multivitamin is best and we found that our formula is ideal for those that train. An average diet already gets an average amount of nutrients and vitamins. This is designed to supplement that and not provide you with megadoses that will just upset your stomach and/or make you feel toxic. 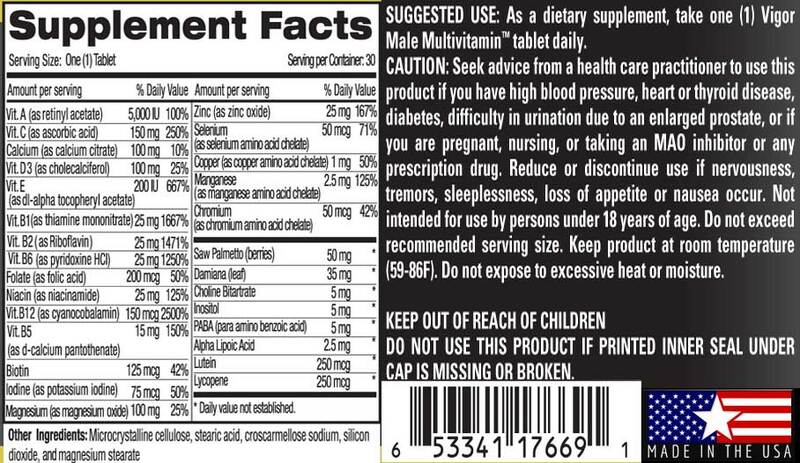 Vigor Male Multivitamin™ comes in an easy to swallow tablet goes to work to improve your health all day. Other Vigor products go great with this formula and we highly advise it over other multivitamins while taking our stacks. *Disclaimer: Individual Results May Vary. These statements have not been evaluated by the Food and Drug Administration. This product is nto intended to diagnose, treat, cure, or prevent any disease.